Kim Kardashian’s Pregnancy Nightmare: She Has Gained 65 Pounds! Kim Kardashian is starting to pack on the pounds now that she’s halfway through her pregnancy. The reality star who announced that she was expecting a baby to Kanye West on New Year’s Eve, has been looking bigger and bigger whenever we catch her out in LA these days, which is normal of course, but Kim is worried more than ever now that her weight has increased. She isn’t worrying about the fact that she will no longer fit into her designer clothes, she’s scared on what Kanye will think of her with her ever-so-growing booty, and her overall 65-lb weight gain, – and we all know that he likes his girls slim and curvy. The latest issue of Star magazine reports that Kris Jenner was not expecting to see her daughter gain so much weight within months after making the announcement. However, it is being looked at as a good business move seeing that Kim can easily snag a $4 million with a weight loss company to get back into tip-top shape and that’s supposedly what Kris is doing right now. After Kanye had ruined her chance of doing an exclusive deal with a magazine to announce Kim’s pregnancy, the momager plans to go all out on the weight losing company deal, regardless of what her boyfriend makes of it. The reality star’s favorite binge food to eat currently is lots of pasta meals, full-on sugary cakes and ice cream throughout the day,- Kim is aware that her fast weight gain just halfway through pregnancy isn’t exactly considered normal which is why she has been hitting the gym every now and then to keep away some of the calories she had indulged herself on. 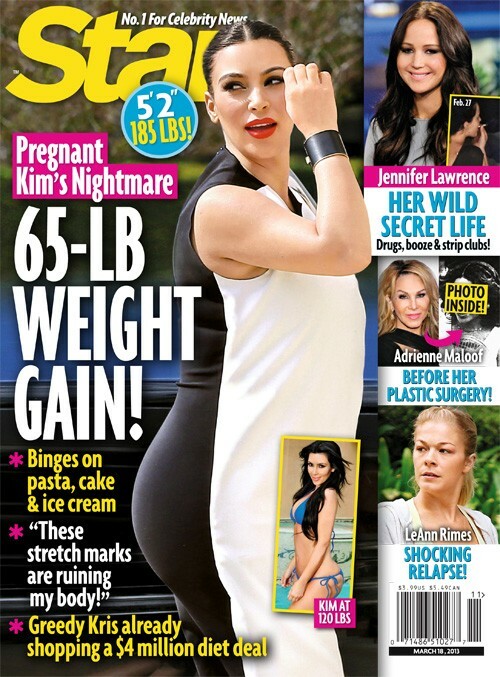 For more details on Kim’s crazy weight gain, catch the newest issue of Star on newsstands now. Suri Cruise Kidnap Shocker: Details HERE!